Welcome to our Muzzleloading Club site. We are currently located at the Dog Creek Campgrounds. This area serves a welcome site for many a wayfairing stanger, and they learn to call it home. We welcome everyone, and hope they enjoy their stay while they are here. 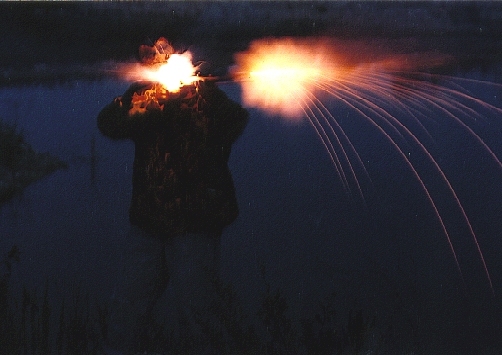 This is what it is like to touch off a flintlock around Dogcreek at night. Click on the shooter and see what PR Custom Bullets has to offer for muzzleloaders. Need to send up smoke signals? Friends of ours in Kalispell, Mt. Friends of ours in Libby, Mt. This web site is another creation by Two Feathers.